At one time the Otoes, the Missourias, the Winnebago and the Iowa Tribes were part of a single tribe that lived in the Great Lakes Region of the United States. In the 16th century the tribes separated from each other, although they remained in close proximity to each other in the lower Missouri River Valley. The Otoes who called themselves Jiwere (jee-WEH-ray) and the Missourias who called themselves Nutachi (noo-TAH-chi) were related to each other in language and customs, but they were two distinct people. The state of Nebraska gets its name to the Otoe-Missourias. It is from two Otoe-Missouria words “Ni Brathge” (nee BRAHTH-gay) which means “water flat”. This name came from the Platt River which flows through the state and at some places moves so slowly and calmly that it is flat. The state of Missouri and the Missouri River are both named after the Missouria Tribe, which once lived in the region and controlled traffic and trade along the Missouri River and its tributaries. Trade was a vital part of Otoe and Missouria life for centuries. They traded with the Spanish, French and Americans for various goods. All three nations courted the Otoes and Missourias for exclusive trading agreements. In the summer of 1804, the Otoe and Missouria were the first tribes to hold council with Lewis and Clark. The captains presented to the chiefs a document that offered peace while at the same time established the sovereignty of the United States over the tribe. Unfortunately, however, contact with Europeans also brought new diseases. Smallpox decimated both tribes and weakened their hold on the region. The Missouria Tribe lost many people to disease and warfare with other tribes. In the late 1700s, with few people remaining, the Missourias went to live with their relatives the Otoes. The Otoe-Missourias were predominately hunter-gatherers. They did grow and harvest corn, beans and squash, but this was mostly to supplement the bison and other game that made up the majority of the Otoe-Missouria diet. As was their tradition, the tribes would migrate to follow the buffalo, but they stayed in the general area of Nebraska, Iowa, Missouria and Kansas. The traditional lands of the Otoe-Missouria people were desirable farming lands to the settlers from the east. As more and more settlers came onto Otoe-Missouria land, the tribal people fought to protect it. Although a small tribe, the Otoe-Missourias bravely fought any who attacked them including the white settlers. This created a conflict for the US and they took action to protect settlers. In 1855 the Otoe-Missouria people were confined to a reservation on the Big Blue River in southeast Nebraska by the US government. Life on the Big Blue Reservation was hard. The tribe was not allowed to hunt for buffalo. The government encouraged a shift from a migratory lifestyle to an agrarian one without consideration of long established tradition or social structure. For years the tribe watched as acre by acre of their land was sold off by the government to non-Indians. They suffered as treaties were broken and food, medicine, livestock and basic essentials were not delivered as promised. Sickness was rampant, children starved and the mortality rate climbed higher year after year. In 1881 they were moved to Red Rock, Oklahoma, where the tribe is currently located. Otoe and Missouria children were taken away from their parents and sent to boarding schools to be “civilized”. The children were forced to learn English. Tribal elders remember being punished for speaking their native language at school. The stigma of speaking the traditional language passed into the home. Some tribal members did not teach their children their language because for fear of being punished in school or because they thought it would be better for them to learn “white ways”. Because so many of the traditions and the language were discouraged by the government, much of the language has been lost. Today the tribe is struggling to maintain what knowledge of the language still exists. In 1887, Otoe-Missouria land was again taken from the tribe when the U.S. passed the Dawes Act. The act provided for the distribution of tribally held lands in Indian Territory (Oklahoma) into individually-owned allotments. This broke up the Otoe-Missouria reservation and opened land deemed as “surplus” to settlement by non-Indians and development of railroads. It was not long before one-half of the allotted lands were lost from Indian possession due to arbitrary and exploitive practices of so-called guardians. 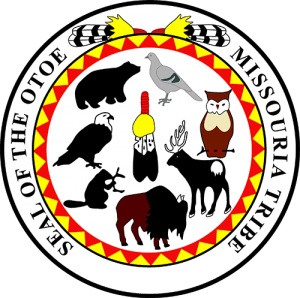 In the 1960s the Otoe-Missourias fought in court for justice and received judgment on their land claims case. Today most of the nearly 3,000 tribal members still live in the state of Oklahoma, but there are members who live throughout the United States including New Jersey, California, Hawaii and Alaska. The tribe is still one of the smaller tribes in Oklahoma, but led by a progressive Tribal Council, they have turned their gaming revenue into long-term investments such as retail ventures, loan companies, agriculture, natural resource development, hospitality, entertainment and several other projects still in development. Tribal members continue to preserve tribal traditions with feasts, dances, an annual powwow and song leaders continue lineage, clan and tribal ties. The Otoe-Missouria Tribe of Indians is headquartered in Red Rock, Oklahoma and their tribal jurisdiction includes Noble, Oklahoma and Kay County, Oklahoma. Few tribal members still speak the Otoe or Chiwere language; however, the tribe has a program to revitalize the language. Language classes are held weekly in Edmond, Oklahoma. The tribe operates its own housing authority and issues tribal vehicle tags. They own two gas stations, two smoke shops, two financial services companies, and five casinos. The estimated annual economic impact of the Otoe-Missouria Tribe is $79 million. The Otoe-Missouria casinos are 7 Clans Paradise Casino in Red Rock; First Council Casino in Newkirk, and Lil’ Bit of Paradise Casino—Chilocco, also in Newkirk; and Lil’ Bit of Paradise Casino—Red Rock, in Red Rock. A new casino was opened in May of 2016 in Perry, Oklahoma. In October 2016, through a deal reached with CEO Mark E. Curry, the Tribe acquired technology vendor MacFarlane Group. MacFarlane Group previously assisted the Tribe with underwriting and call center support for American Web Loan, one of the Tribe’s financial services companies. The Tribe still receives technology support from Think Finance for its other financial services business, Great Plains Lending.